(a) Debit / Credit Card (b) Net Banking. After filling the online Application form with the required details, verify all the details carefully and press Submit button. Filled in Application Form will be generated that contains Application number along with filled details. Take print out of filled-in Online Application Form. Use the Application number for future correspondence till the admission process is completed. 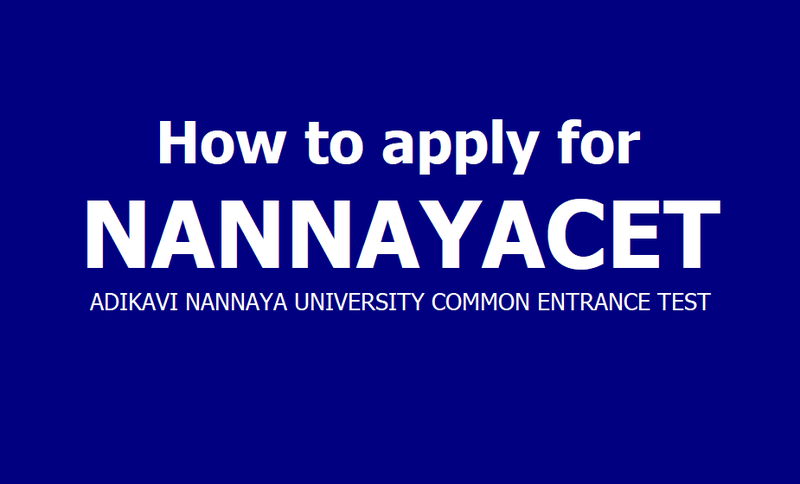 NANNAYACET 2019: Directorate of Admissions, Adikavi Nannaya University, Rajamahendravaram (erstwhile Rajahmundry) invites applications from eligible candidates for admission through Adikavi Nannaya University Common Entrance Test (NANNAYA CET)-2019 into various Science and Arts Courses offered at Campus Colleges of Adikavi Nannaya University (AKNU), Post Graduate Centers at Kakinada & Tadepalligudem and Colleges affiliated to AKNU offering P.G. Courses in East and West Godavari Districts for the Academic year 2019-2020. (b) NANNAYACET 2019 NANNAYACET – 2019 Information Brochure. 3. Open the website http://AKNUdoa.in from your browser(Internet Explorer / Chrome / Firefox). 4. Click on the link appearing as Click here to register for NANNAYACET 2019/NANNAYACET – 2019 Online Application. 14. Mow your mobile will receive a message “Your NANNAYACET – 2019 application is submitted successfully with Application No : XXXXX with Payment Ref.Id : XXXXXXXX”. a) The University reserves the right to reject the application of a candidate at any stage, if a) the application is incomplete. b) the candidate fails to satisfy the prescribed eligibility conditions. c) false or incorrect information is furnished. b) Any change whatsoever, including that of caste/community status or category, shall not be permitted to be made in the filled in application once it is received by the University. No correspondence will be entertained in this regard. c) Upload of complaints will be allowed during 20th - 26 th April 2019.
d) The Director, DOA is not responsible for non-submission of application by the notified date and time for any reason whatsoever. e) All candidates who apply for entrance test satisfying the eligibility criteria will only be allowed for appearing the entrance test. f) Allowing a candidate for the entrance test does not provide any claim or right for admission into P.G courses. They have to satisfy the eligibility criteria given. The decision of admission authority is final in all such matters. g) The candidate should PRESERVE THE HALL TICKET to produce at the time of test and later at the time of admission into the course. h) For NCC/ NSS / Sports categories the certificates obtained in qualifying examination alone are considered. i) If a candidate wish to appear for two tests then a separate application must be submitted for each test j) The candidates need not apply separately for admission into University Colleges, Campus Colleges at Kakinada and Tadepalligudem, and Colleges affiliated to AKNU. k) INCOMPLETE APPLICATIONS WILL BE SUMMARILY REJECTED.